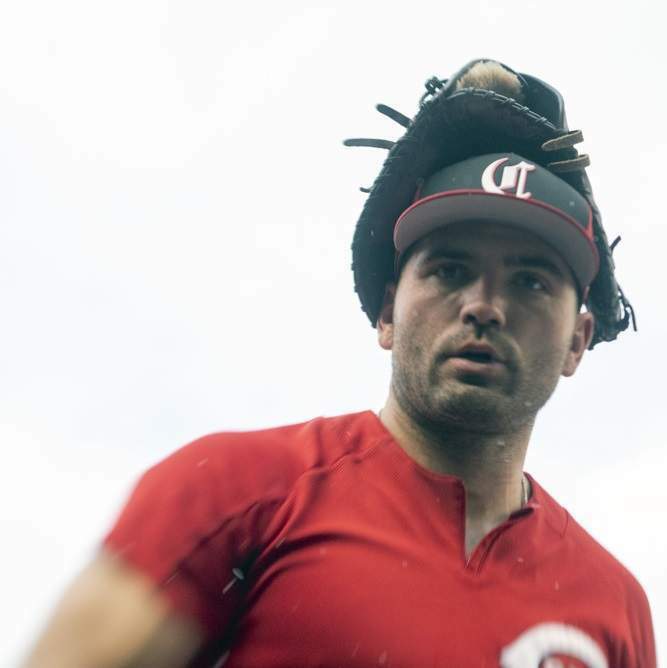 Continuing my offseason theme of profiling 2018’s surprise players, I’ll now turn to one of 2018’s bigger fantasy baseball disappointments: Cincinnati Reds’ first baseman Joey Votto. ESPN’s season-ending Player Rater named Votto just the No. 22 first base option, below such players as Jurickson Profar, CJ Cron, and Eric Hosmer. 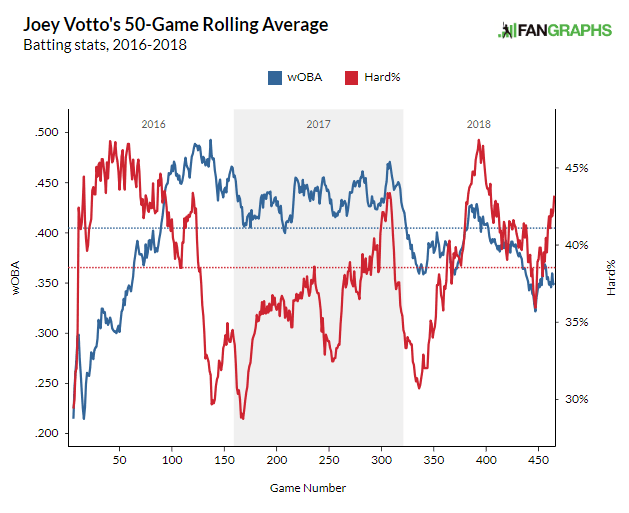 Entering his age-35 season, Votto could conceivably be entering a severe decline period, at least in terms of the traditional 5-by-5 counting categories. Early indications are that owners aren’t buying that, though. Votto’s coming off the board 66th on average, sixth among first basemen. Early drafters seem to think Votto’s still an above-average fantasy first baseman. 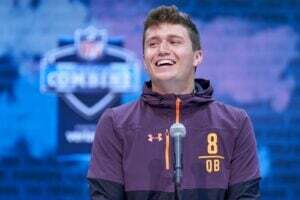 Is the optimism warranted? The Demise of Joey Votto? Let’s start with the necessary caveats to appease Reds’ (and Canadian) fans: Joey Votto had a perfectly-acceptable 2018 season. A .284/.417/.419 plays and Votto continues to be one of the league’s best defensive first basemen. He’s in no way a drag on the team’s roster and, despite Marty Brennaman’s bizarre assertions to the contrary, he’s been worth every penny the Reds have given him. The 2018 season was far less valuable for fantasy owners, though. Votto’s numbers plummeted in all five main categories. While he was still eminently valuable in on-base leagues, he was a mediocre fantasy contributor in standard leagues. Most concerning with Votto was his significant power drop-off from 2017. Among full seasons in his career, 2018 saw his worst home run (12) and slugging (.419) marks. Some of that was about his first DL stint in four years (a right leg contusion), but that doesn’t explain everything. Indeed, Votto suffered the injury after getting hit by a Ryan Madson pitch on August 4. August was his worst month by far, so it seems fair to write those numbers off as him playing through injury. That explanation isn’t entirely satisfactory, though. Votto didn’t slug above .500 in any calendar month, including those in which he was (to public knowledge) healthy. In fact, June was Votto’s only calendar month with an above-average isolated power. What happened? We’ll turn to the batted ball data here. At first glance, there doesn’t seem to be a ton here. Votto’s hard contact rate was down in April, but it rose rather significantly as he caught fire in June. He had his peaks and valleys, but altogether, this was a career-best season for Joey Votto in terms of hard contact. Not all contact is created equally though. As Al Melchior recently found at Rotographs, hitting the ball hard in the air is more meaningful than squaring balls up in general. Here, Votto shows signs of faltering. At Baseball Savant, we can see that this was Votto’s worst season by average exit velocity on fly balls. Still, it was only 0.7 MPH off his total from 2017, when he hit 36 home runs. Should we expect less than one mile per hour to make that big a difference? Probably not. More concerning, though, is the direction in which Votto was hitting his air balls. In 2017, Joey Votto pulled over a quarter of balls hit in the air; last year, his pull rate was down to 20.6%. Intuitively, pulled air balls feel like the best type of contact, and the numbers bear that out. Last year, the league slugged 1.399 when pulling and elevating the ball, compared to .648 when elevating the ball to other fields. Votto losing 21 pulled air balls from the season before is a pretty strong explanation for the dip in power. (Nor can the injury explain these struggles, either. Both Votto’s exit velocity and pull rate on air balls were relatively unchanged before and after August 4). As he enters his mid-30’s, it’s possible Votto’s simply losing the bat speed necessary to yank balls pull-side. Indeed, in a March interview with the Athletic’s Eno Sarris, he acknowledged as much. “Without a doubt, the ball doesn’t come off my bat as hard as it used to,” Votto confessed. It’s worth noting also that external factors might be working against Joey Votto, too. The baseball, which had been exceptionally lively in 2016-2017, seems to have come back to earth in 2018. MLB concluded that the home run surge leaguewide was attributable to reduced drag on the ball; essentially, batted balls of similar exit velocities were flying further than they used to. This seems to have leveled off in 2018. Despite the league posting a slightly-higher exit velocity on fly balls in 2018 versus the year prior, the home run rate fell by a percentage point. That change seems miniscule at first glance but is quite important considering how many batted balls there are each season. It’s a superficial glance, to be sure, but there’s some reason to believe the ball isn’t traveling as far anymore. For players with massive raw power, this isn’t a huge deal. They’ll continue to clear fences with ease. As Votto himself notes, though, he’s no longer one of those players. Those extra few feet matter more for Votto than for Aaron Judge. If the ball has indeed leveled off (and there will no doubt be countless analyses of this question this offseason), it’s fair to wonder if Votto’s days as a 25-home-run bat are behind him. Without home runs, Votto becomes a pretty generic fantasy asset. Given his age, batted ball profile and the seeming constant fluctuations of the baseball, Votto’s days as 30-100 player might be gone. He’ll be eminently valuable in on-base leagues- and I’d take the over on 12 home runs in 2019- but Votto’s no longer a top 30 bat in standard leagues. At his current ADP, owners should probably stay away.